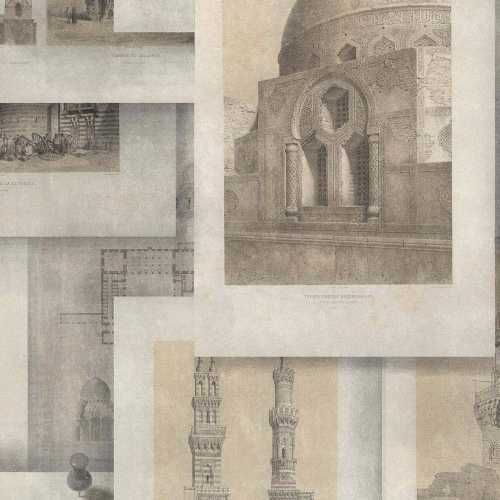 Inspired by historic art and photography, MINDTHEGAP design and manufacture beautiful contemporary designs with timeless concepts in order to create a collection of designs that are like no other. The Arabian Monuments Wallpaper is one of the brand’s photographic styled wallpapers. The Arabian Monuments Wallpaper features numerous warm toned black and white photographs of Arabian Monuments that have been overlapped for a collage effect. Each photograph features an off-white border that prevents the wallpaper design from looking too busy. 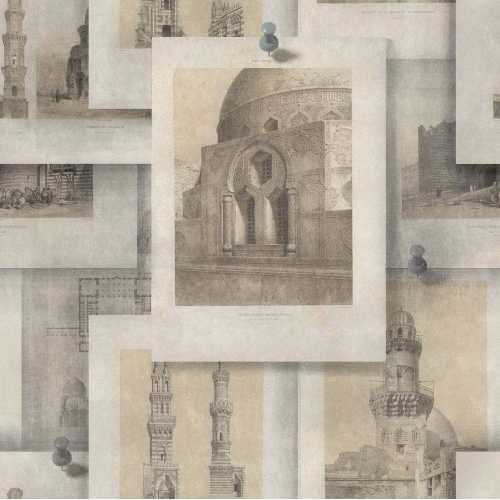 The designers behind this antique styled luxury wallpaper have created a pin-board styled design with each photography appearing as though it has been pinned to the wall with a three-dimensional pin drawing above each photograph and each photograph and each pin featuring a soft grey shadow.